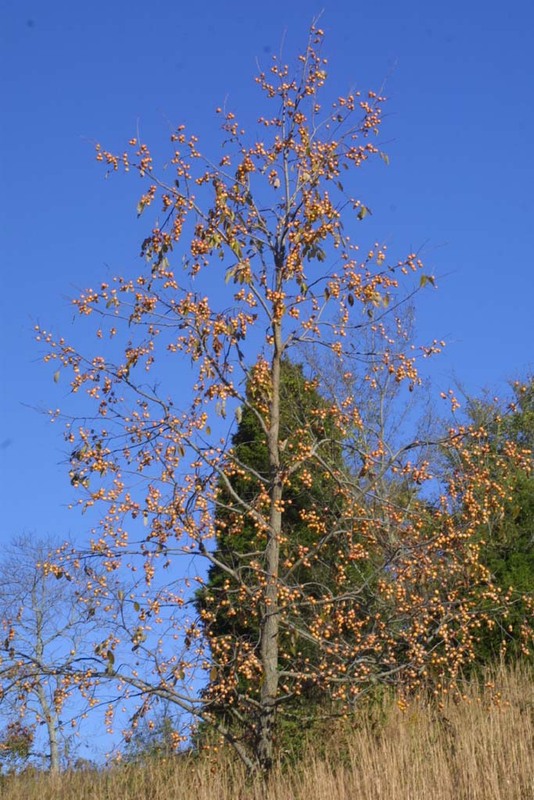 Diospyros virginiana tree in fruit. Copyright 2003 Steven J. Baskauf. bioimages.vanderbilt.edu (Accessed 3/018). Diospyros virginiana is a tree to 15 m tall, colonial from root sprouts, usually dioecious (sexes separate); stems often crooked, twigs gray, mature bark black, square fissures, twigs thin; winter buds very dark with two overlapping scales; vein scar one, linear (Harlow 1946; Petrides 1988). 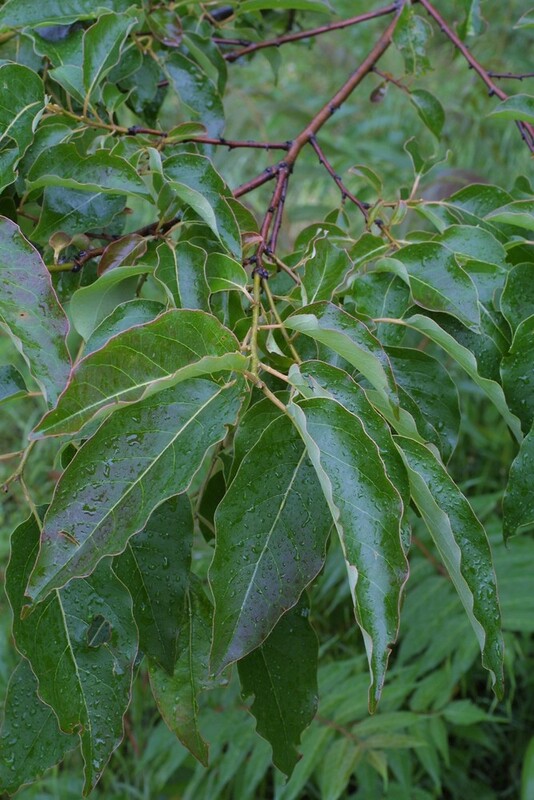 Diospyros virginiana leaves. By Steven Baskauf. Copyright © 2018 CC-BY-NC-SA. www.cas.vanderbilt.edu. New England Wild Flower Society. gobotany.newenglandwild.org (Accessed 3/2018). Leaves alternate, stalk to 2 cm long, blade to 18 cm, entire, tip pointed, margin smooth. 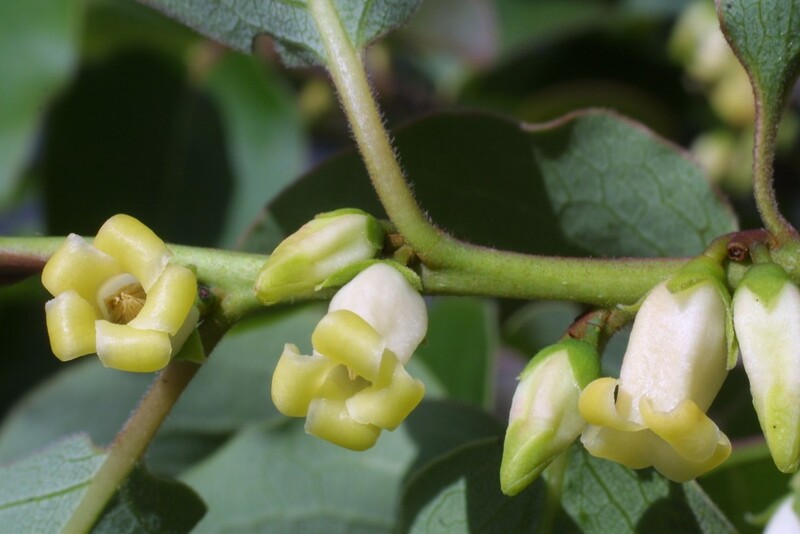 Diospyros virginiana female flower. David G. smith. Delaware Wildflowers. delawarewildflowers.org (Accessed 3/2018). Diospyros virginiana male flowers. By Steven Baskauf. Copyright © 2018 CC-BY-NC-SA. www.cas.vanderbilt.edu. New England Wild Flower Society. gobotany.newenglandwild.org (Accessed 3/2018). 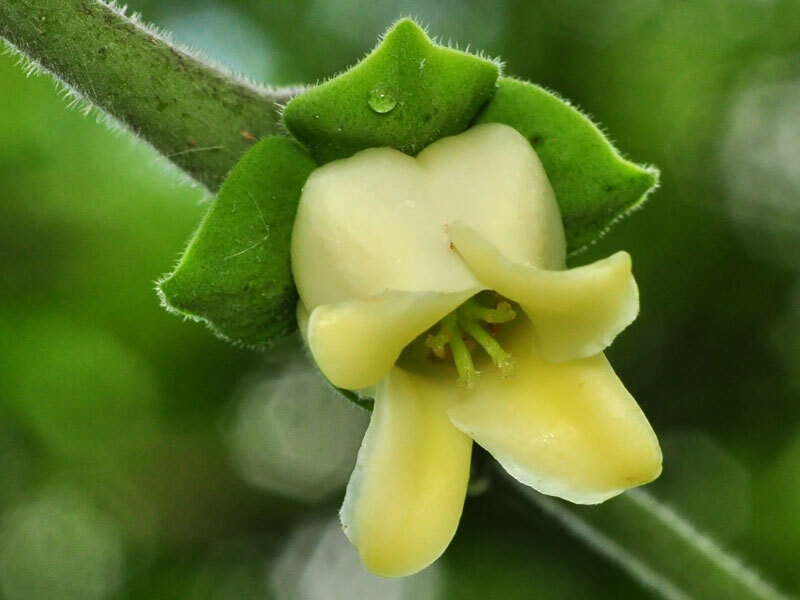 Flowers yellow-green, 4-parted, female flowers to 2 cm, fragrant, petals and sepals attached below large 8-parted ovary; male flowers to 1 cm, stamens longer than petals; blooms May-June. Diospyros virginiana ripe, edible fruit. David G. smith. Delaware Wildflowers. delawarewildflowers.org (Accessed 3/2018). 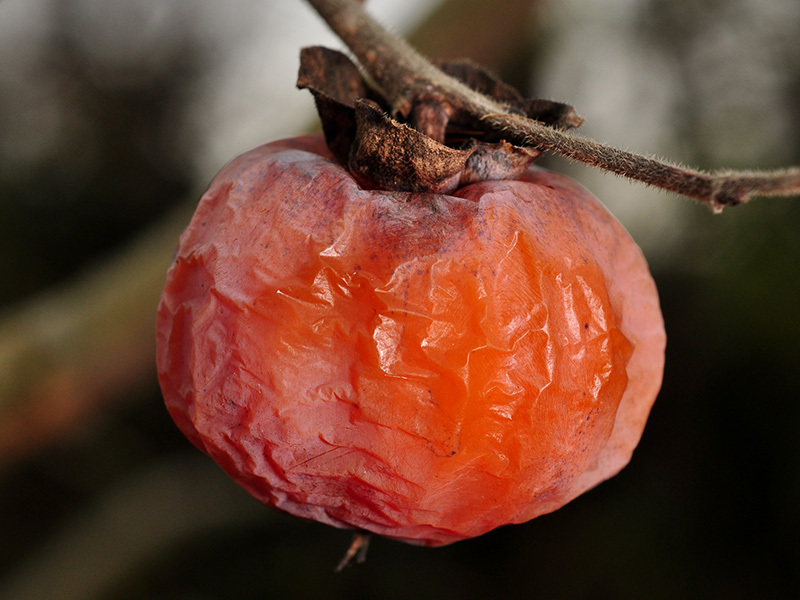 Fruit fleshy, orange with waxy bloom, about 3 cm wide, above persistent calyx, Oct.-Nov., very astringent until after frost; 3-8 seeded, seeds narrow, flat ca 1cm; seed load 12%; pulp nutrients: water 79% lipid <1%, protein 3%, CHO 40% (White 1989). Eaten by many birds and mammals, including bears, raccoons, coyotes, foxes, skunks and opossum (Martin et al. 1951; Wilson 1993; Cypher and Cypher 1999). Seeds must overwinter before germination. Frequency in New York City: Occasional. (NYS S2, rare). Habitat: Moist to wet soil at edges of swamp forests. NYC is close to northern limit of range. Prefers soil pH 6-6.5 (probably more tolerant), often grows on wetland edges. Tolerant of moderate drought. Moderately tolerant of flooding, soil compaction. Intolerant of shade, index 2-4 (Bacone et al. 1976; Baker 1945; Hightshoe 1988), needs more than 5.5% full sunlight to grow (compensation point), but cannot use more than 53% full sun (saturation point), (Hicks and Chabot 1985). Notes: Persistent in forest understory. Cut or burned trunks resprout (Burns and Honkala 1991).